The net short post ion of U.S. banks have reached the lowest level since at least five years. It could be a short-term counter-cyclical buy signal. In early June held the COMEX futures trading U.S. banks net short positions in the amount of only 13,234 contracts. That comes forward sales equal to 2,057 tons of silver and corresponds to the lowest level since at least five years or the lowest value since gold reporter the monthly data analyzed (see chart). For comparison: In February 2013, the U.S. banks were net the equivalent of 6,249 tons on the seller's side! Compared with the previous month, the short positions of particularly influential on the COMEX U.S. banks went back to silver at 23.35 percent. The net short positions fell by 19.72 percent. The figures come from the latest Bank Participation Report of the U.S. CFTC. Date: June 3, 2014. The data are further evidence that silver is currently oversold strong and that further downside seems to be so limited in silver. Because the experience of recent years has shown that the precious metal prices always came under particular pressure when the U.S. banks had built up high short positions in the respective metal. Forward sales in the amount of 2,000 tons while still seem very high. This represents financial well-tenth of the annual silver mine production. And with Gold U.S. banks are finally positioned net since June 2013 on the buying side. 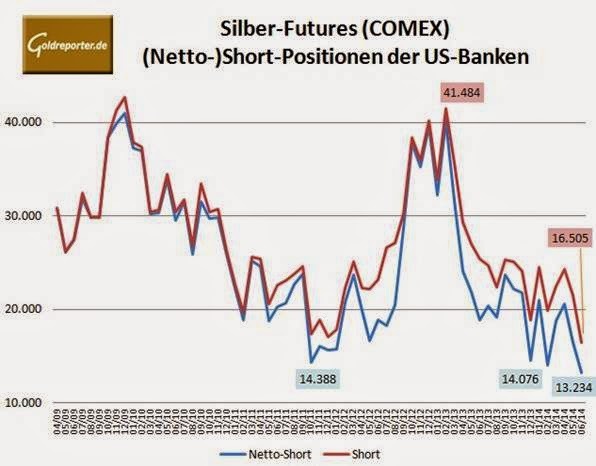 Nonetheless, in the historical context of the current silver short positions of the U.S. financial institutions must be regarded rather as a (counter-cyclical) bullish sign.